Battery Tealight Candles - Enjoy the ambiance of candle light without the flame with a battery operated candle! This for the pillars and votives. This battery-operated tealight adds the ambiance of candlelight without the danger of the flame! 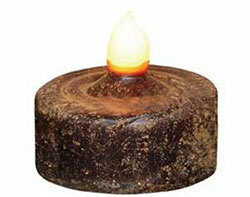 This version is dipped in dark-colored, sweet smelling beexwax, and dusted with cinnamon powder. 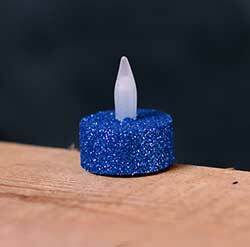 Blue Glitter LED Tealight Candle, by Our Backyard Studio in Mill Creek, WA. Our battery tea light candles are hand-painted and coated with superfine, super sparkly glitter. Perfect for your party, event, home, or holiday decorating needs! This is for the BLUE glittered tealight. This battery-operated tealight adds the ambiance of candlelight without the danger of the flame! This is for the regular tealight candle (not a timer candle). 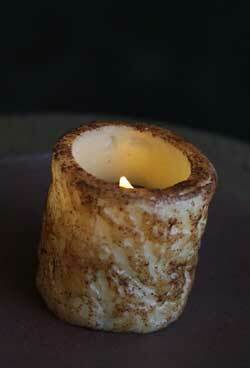 Burnt Ivory/Cinnamon Battery Pillar with Tealight, by The Hearthside Collection. 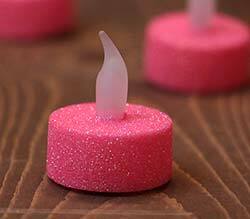 This battery-operated candle adds the ambiance of candlelight without the danger of the flame! Wax shell is ivory colored, and rolled in spices. Measures approx 2.5 x 2.5 inches. Inside is a removable matching battery tealight candle. Takes two AG13 cell batteries (included and replaceable). 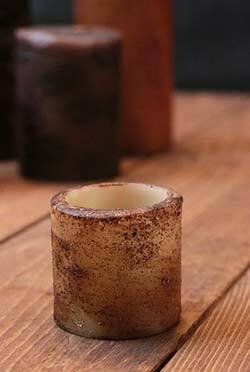 Burnt Ivory/Cinnamon Tealight Pillar with Tealight, by The Hearthside Collection. 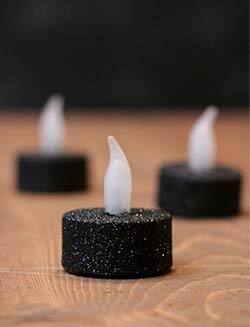 This battery-operated candle adds the ambiance of candlelight without the danger of the flame! Wax shell is ivory colored, bumpy, and rolled in spices. 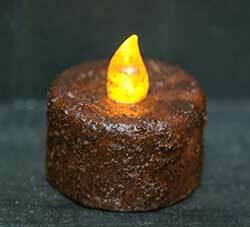 Burnt Mustard Battery Tealight, by The Hearthside Collection. This battery-operated tealight adds the ambiance of candlelight without the danger of the flame! Takes two AG13 cell batteries (included). 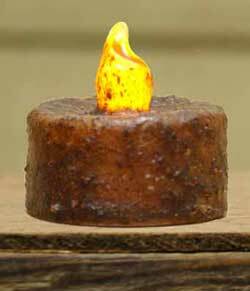 Candle is primitive-style - mustard, with a rolled-in-spices grubby look. This battery-operated tealight adds the ambiance of candlelight without the danger of the flame! 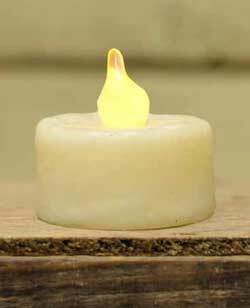 This is for the tealight candle with timer. 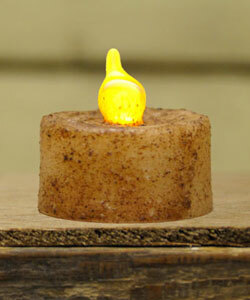 Candle is primitive-style mustard, rolled in cinnamon grubby look. Gold Glitter LED Tealight Candle, by Our Backyard Studio in Mill Creek, WA. 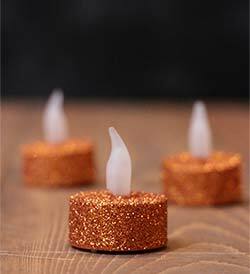 Our battery tea light candles are hand-painted and coated with superfine, super sparkly glitter. Perfect for your party, event, home, or holiday decorating needs! This is for the GOLD glittered tealight. Measures 1.5 inches in diameter, and 1 7/8 inches tall. Has a gentle flicker. Turns on/off with a switch on the bottom. Glitter is well adhered with minimal shed. Uses one CR2032 Lithium battery - one is included, plus we toss in an extra "just in case" battery for free! Price is for a single candle, with battery, plus an extra battery. Lots of other colors available too! 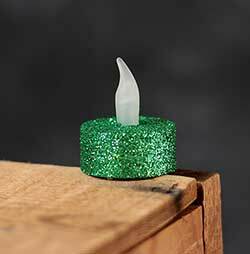 Green Glitter LED Tealight Candle, by Our Backyard Studio in Mill Creek, WA. Our battery tea light candles are hand-painted and coated with superfine, super sparkly glitter. Perfect for your party, event, home, or holiday decorating needs! This is for the GREEN glittered tealight. Ivory Tealight Pillar with Tealight, by The Hearthside Collection. 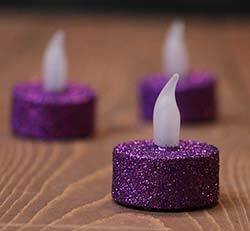 This battery-operated candle adds the ambiance of candlelight without the danger of the flame! Wax shell is ivory colored, with a bumpy primitive appearance. Measures approx 2.25 x 2.25 inches. Inside is a removable matching battery tealight candle. Takes two AG13 cell batteries (included and replaceable). Ivory Battery Tealight, by The Hearthside Collection. 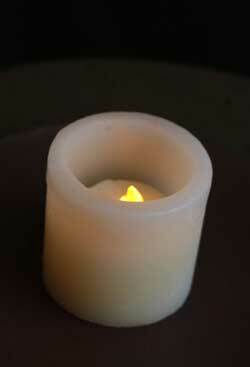 This battery-operated tealight adds the ambiance of candlelight without the danger of the flame! Takes two AG13 cell batteries (included). 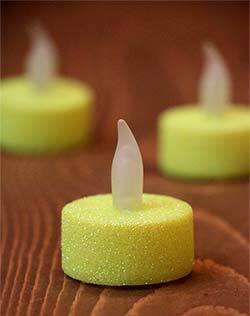 Candle is ivory with a wax-dipped look. Neon Pink Glitter LED Tealight Candle, by Our Backyard Studio in Mill Creek, WA. Our battery tea light candles are hand-painted and coated with superfine, super sparkly glitter. Perfect for your party, event, home, or holiday decorating needs! This is for the NEON PINK glittered tealight, a bright candy colored pink perfect for a girl's room, birthday or wedding decor, candy-themed holidays, etc. Measures 1.5 inches in diameter, and 1 7/8 inches tall. Has a gentle flicker. Turns on/off with a switch on the bottom. Glitter is well adhered with minimal shed. Uses one CR2032 Lithium battery - one is included, plus we toss in an extra "just in case" battery for free! Price is for a single candle, with battery, plus an extra battery. Lots of other colors available too! Neon Yellow Glitter LED Tealight Candle, by Our Backyard Studio in Mill Creek, WA. Our battery tea light candles are hand-painted and coated with superfine, super sparkly glitter. Perfect for your party, event, home, or holiday decorating needs! This is for the NEON YELLOW glittered tealight, a bright candy colored yellow perfect for a kid's room, birthday or party decor, candy-themed events, etc. Measures 1.5 inches in diameter, and 1 7/8 inches tall. Has a gentle flicker. Turns on/off with a switch on the bottom. Glitter is well adhered with minimal shed. Uses one CR2032 Lithium battery - one is included, plus we toss in an extra "just in case" battery for free! Price is for a single candle, with battery, plus an extra battery. Lots of other colors available too! 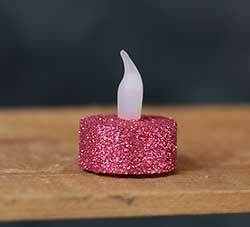 Pink Glitter LED Tealight Candle, by Our Backyard Studio in Mill Creek, WA. Our battery tea light candles are hand-painted and coated with superfine, super sparkly glitter. Perfect for your party, event, home, or holiday decorating needs! This is for the PINK glittered tealight, a medium shade of vintage-colored pink, perfect for Valentine's Day, a girl's room, birthday or wedding decor, candy-themed holidays, etc. Measures 1.5 inches in diameter, and 1 7/8 inches tall. 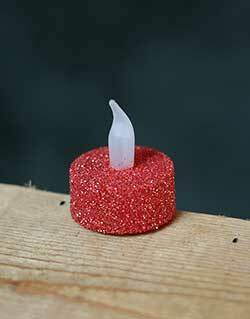 Red Glitter LED Tealight Candle, by Our Backyard Studio in Mill Creek, WA. Our battery tea light candles are hand-painted and coated with a handmade, hand-dyed blend of super sparkly glitter in a warm red color. Perfect for your party, event, home, or holiday decorating needs! Measures 1.5 inches in diameter, and 1 7/8 inches tall. Silver Glitter LED Tealight Candle, by Our Backyard Studio in Mill Creek, WA. Our battery tea light candles are hand-painted and coated with superfine, super sparkly glitter. Perfect for your party, event, home, or holiday decorating needs! This is for the SILVER glittered tealight. Measures 1.5 inches in diameter, and 1 7/8 inches tall. Has a gentle flicker. Turns on/off with a switch on the bottom. Glitter is well adhered with minimal shed. Uses one CR2032 Lithium battery - one is included, plus we toss in an extra "just in case" battery for free! Price is for a single candle, with battery, plus an extra battery. Lots of other colors available too!